Checked Out our TIPILA Web Quest? Lakota people are a people on the move! From ancient times, through Buffalo days and the reservation period, all the way up until today we have always been On The Move! Our nomadic origin and history have made us a tribe with traditions of change. Moving through an ever changing world, we became part of its' rhythm and that rhythm formed our traditions. As you proceed, be sure to check out our New Tipila WebQuest by clicking on the Tipi Graphic Link below! The hunt, the fight, moving camp and ceremonies year around, all provided the foundation upon which we built our traditions. Our songs, dances and societies were all parts that made up our whole way of life. In a journey over thousands of years we came, to take our place in the history of the world. All that we bring is the knowledge of our long journey here. It's been said that, long before there were horses there were dogs who lived among us. We taught them and they taught us to move camp in the ways we do. We made the travois for them. So, when the horses came we already knew something about them. Working with them we further enhanced our ways of being on the move. We made beautiful things for our horses to wear, and like our selves, we dressed them up at all the right occassions! When the wagons came we hooked them up to the horses, the way we'd seen it done, and rode on into town. Finally, when the horseless carriage arrived we traded, or sold, our wagons and got us one of those. Now, our lands are full of dogs and cars. Some work and some don't, yet through it all we've built on our knowledge of the ever changing world. We've continued with our traditions of change. Still today, the Lakota are some of the best horsemen around. Many Lakota horsemen have taken their place in the arenas of the day. Therein lies a story of our past and our journey here. So today, almost two hundred years after Lewis and Clark first gave us beads , cloth and other trade goods in order to pass through our worlds, we stand within that greater world we first got a glimpse of then. Huwo! Come on in and see who we are today! My tribe, the Oglala-Lakota are part of a large Lakota Nation with three distinct Lakota dialects. So depending on where we are from, the eastern areas, the western areas or the central part of our territories, we would call ourselves Nakota, Lakota or Dakota, respectively. Many tribes are included or related to the Lakota Nation. Our Oglala Lakota Flag, symbolizes the circle of tipis, or these many bands of the nation. The various tribes of the Nation are located mainly throughout the northern plains of the United States. To all Lakota the "Paha Sapa", the Black Hills of South Dakota is Home. the heart of our world on Mother Earth. We've survived from ancient times until today to continue our traditional ways. Some of our oldest knowledge, the knowledge of the stars has been recovered and is available today for our people to learn about and follow. The legacy of our oldest stories survives still today among the Lakota people. We still have our Original Calf Pipe which was given us by White Buffalo Calf Woman. Arvol Looking Horse is the current Keeper of the Pipe, for the Lakota nation. Our oldest songs and some newer ones are actively preserved by traditional Lakota drum groups. You can learn more about Lakota Olowan, "Lakota Songs" from drum group links, here and the traditional music of Sissy Goodhouse on the Makoce Records label. Kevin Locke is a Lakota flute player who has done everything to recover and preserve our Lakota flute traditions for the people of the Nation. Some of his recordings offer stories blended in with his flute music. Learn more about Kevin Locke and his works! In addition to the Oglala Sioux Tribe itself, other important institutions on my reservation at Pine Ridge, S.D. are the Red Cloud Indian School, KILI-FM radio and the Oglala Lakota College. All provide valuable and critical services to people of our tribe. Red Cloud Indian School"The mission of Red Cloud Indian School - Holy Rosary Mission, a Catholic Institution administered by the Jesuits and the Lakota People, is to develop and grow as a vibrant Church, through an education of the mind and spirit that promotes the values of the Lakota Culture". KILI FM radio offers programming in english and Lakota languages, sending a signal out across several states that spans the far reaches of the Lakota Nation today. In addition to studio programming in service to the community, they also broadcast on site from remote locations like basketball games and tribal events. The Oglala Lakota College offers academic programs to support the preservation of our Lakota ways, in addition to its' educational programs which help to meet the career development needs of members of the tribe. Indian Country Today, once began as "Lakota Times" on the Pine Ridge reservation in South Dakota, but later moved to Rapid City and has now grown beyond the local paper it began as. Yet, they continue to cover Lakota news in their publication. So, you can see, just from this small glimpse into Lakota World that Lakota people are getting into many things to keep pace with todays wider world, including the World Wide Web. with their familiar Lakota view, and the results are impressive, check them out!. So, as I said this is only a glimpse, but if you want to know and see more of Lakota World, then just click on the links and off you go! 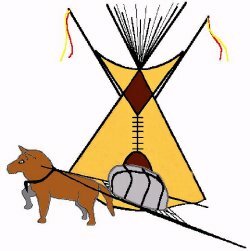 From these selected sites you will find a wealth of new information and more links which can take you further into Lakota World.